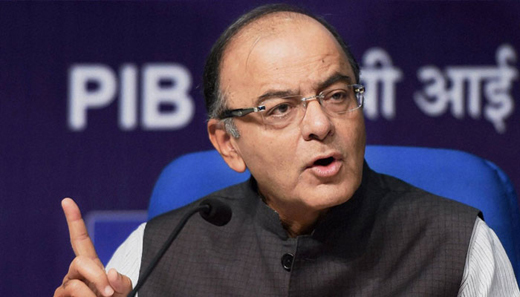 New Delhi, Oct 25, 2017 : Finance Minister Arun Jaitley on Wednesday said that while the Centre has always been ready to put petroleum products under the Goods and Service Tax (GST), a final decision can only be taken once states are ready for it. The government has faced a lot of flak in recent weeks for rising petroleum prices. It led to the Centre cutting excise duty on petrol and diesel by Rs 2 per litre to tame rising inflation and address growing public angst. Three other states - Gujarat, Maharashtra and Himachal went ahead and cut VAT on both fuels. While it is interesting to note that two of these three states go for polls shortly, many experts have been asking why petroleum products cannot be put under the GST regime - something that would inevitably bring prices down further. Jaitley though has deflected the blame for not putting petrol and diesel under GST. "Centre has always been ready for it but the states are not ready. A consensus among states is required," he was quoting as saying by ANI. A consensus though is not likely because state governments stand to lose revenue if petroleum products are put under any of the GST categories. The retail price of a litre of petrol and diesel exceeds due to the levy of central and excise duties. Furthermore, by adding company margin and other costs, the price charged to a petrol pump dealer is the total cost of fuel is being fixed. Even if prices are put under the highest GST bracket of 28 per cent, consumers stand to benefit from paying less. For now though, the central government is contend in asking other states to reduce VAT to ease pressure on consumers. And even that suggestion has mostly fallen on deaf ears. Therefore, leaving the decision of putting petroleum products under GST to consensus among states clearly indicates the low probability of it manifesting.